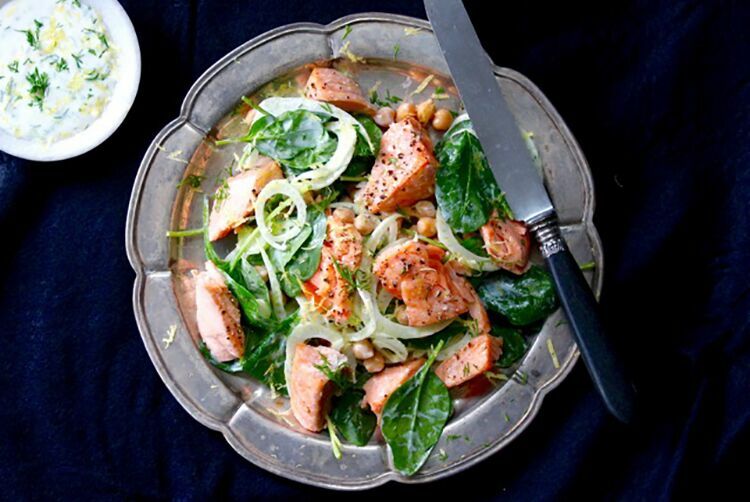 As any nutritionist or derm will tell you, salmon is hands-down one of the best beauty foods. We’re always looking for new – and easy - ways to serve it. One guy who knows about ease is Tim Ryder, the founder of The Cook's Grocer - an awesome healthy food delivery service that delivers pre-shopped for and measured meals to your doorstep along with the simple instructions on how to cook them (no mess – no fuss!). 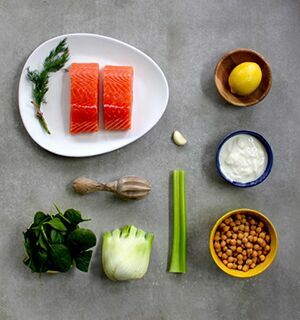 Tim asked the nutritionists they work with for their most beauty-full recipe to share with us, and came back with this little beauty - pulled salmon with shaved fennel salad and dill yoghurt. Preheat your oven to 200°C on fan bake. Next, line a baking tray with greaseproof paper. Place the salmon on the tray and season it with salt and pepper, then drizzle with olive oil. Bake in the oven (skin side down) for 10 minutes. Drain and rinse chickpeas under cold water, then place in a bowl. Finely slice fennel and celery, using a mandolin if you have one. Next, add it to the bowl with the chickpeas and spinach. Whisk together the yoghurt with finely chopped dill, zest and juice of the lemon, and season well with salt and pepper. Combine ¾ of the dressing in the bowl with the salad and toss to perfection. Remove the salmon from the oven and allow it to cool slightly. Gently flake it into generous chunks. Plate the salad and top it with the salmon, and finish it off by spooning over the remaining yoghurt dressing. This recipe and more is available for purchase with delivery from The Cook’s Grocer via www.thecooksgrocer.com.au. This looks delicious! Do they deliver to Melbourne? Not yet, but hopefully soon! We’ll pass your feedback to Tim!